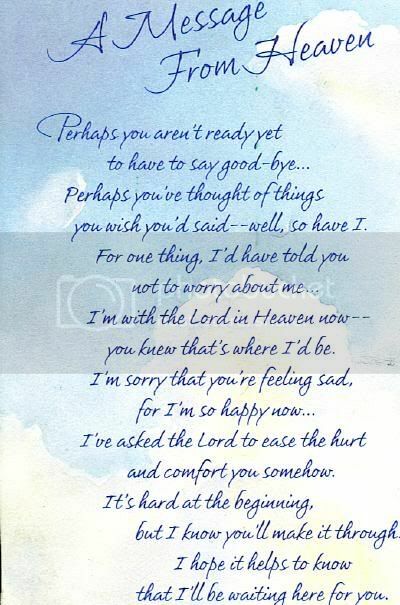 In Memory of my Dear Brother Eddy who is now in Heaven.…. Posted on November 30th, 2009 by roxxyroller in Free Coupons Canada Samples Canadian Free stuff. 5 years ago today, my brother Eddy was taken from us so unex­pect­edly. At the very young age of 43, God took Eddy home. Tears dwell in my eyes as I sit hear play­ing Amaz­ing Grace repeat­edly. My heart has been bro­ken since the day of Eddy’s pass­ing on Novem­ber 30th, 2004. It’s a day never to be forgotten. You see, Eddy was an alcoholic. Dur­ing the last year of his life in 2004, Eddy sought help and became sober. He went from our local detox cen­ter to a rehab cen­ter where he was cer­tainly a changed man. Usu­ally when Eddy was sober, he would shy away from any­one, and anything. The last year of his life he was actu­ally brave while sober! Eddy did things he had never done before! He went places in pub­lic all alone other than the beer or liquor store! He went to dif­fer­ent com­mu­nity events! He went and got a tat­too! Wow we were so proud of Eddy, and we cer­tainly praised him up! He worked at a local steel com­pany for many years, where they paid him sick leave to try and get bet­ter and over­come this alco­holism. You see, if you are not an alco­holic, nor do you know any, then let me explain some­thing that I now know. Eddy was an alco­holic for quite a few years. There are six of us kids, and most of us had the occa­sional social drink, how­ever Eddy would drink all day or night. He would hide the booze around the house and keep a stash. We got to know the signs. We tried to get him help for many years, but it appears that we did not do enough as a family. I often blame myself for Eddy’s death. If only, if only…are words that are in my mind steadily. I suf­fer through bad depres­sion and anx­i­ety as it is, but Eddy’s death seemed to make every­thing a whole lot worse. Eddy owned his own home, and had a really good job. He had a huge heart, and was a come­dian! He was never phys­i­cally abu­sive. He was a great guy, period. He never got into any type of trou­ble with the law. He was sin­gle, because he was too shy to go out and meet girls. I lived at Eddy’s house with my ex-boyfriend at the time, Kevin. He drank quite a bit then, how­ever always man­aged to make it to work, no mat­ter what. After my ex and I split up and he moved out, I remained to stay at my brother Eddy’s. I started dat­ing again and things were fine. One night on Eddy’s 41st birth­day, June 26th, 2001 I stayed at my par­ents overnight. When I went home the next day, the house was a com­plete dis­as­ter. I did not know what the heck went on, but booze appeared to be all over the sticky kitchen floor, and every­thing was strewn about. In awe, I called for Eddy who was in his room to see what had happened. He looked at me with a funny look, almost unaware of what I was talk­ing about. I knew some­thing was wrong, right then and there. He went back to sleep and com­plained of hav­ing a ter­ri­ble headache. I just assumed that it was a hang­over, so let him rest while I cleaned up the entire house. All that week I hardly saw Eddy. He had me call into work for him the major­ity of that week, con­tin­u­ously com­plain­ing of that headache. I got scared and called my other brother to take him to our local emerge depart­ment. They went alright, but they ended up treat­ing and releas­ing Eddy, say­ing that it was ‘just a headache’. Home they came. The fol­low­ing week I heard the same thing almost daily about his headache, and REALLY knew that some­thing was up. The tears flowed like you would not believe after hear­ing those words and I started to shake like crazy. I got ready quick, and away we went! The tiny plane was only a 3-seater, and prior to this Eddy often told me that he would never fly. He watched that movie “La Bamba” with Richie Valens and that really fright­ened him. The doc­tor gave him an ata­van at the hos­pi­tal prior to leav­ing, but it did not even have an effect on Eddy as he was terrified! A short while later we were in the Neu­rol­o­gist Unit at a hos­pi­tal in Sud­bury Ontario. The neu­rol­o­gist came in right away to see Eddy. She asked him alot of ques­tions — as to which he was con­fused by most at that point. (His date of birth, his address,) sim­ple things like that. I was so scared by all of this I needed a cig­a­rette so excused myself and away I went. When I returned, The Neu­rol­o­gist told me that Eddy would be going for an MRI first thing the next day. I stayed at a really nice inex­pen­sive place for fam­i­lies of patients, and went there for the night alone. All I did was lay in bed try­ing to focus on the tv, but all I could think about was my poor brother. I returned to the hos­pi­tal the very next morn­ing super early, and went with Eddy for his MRI. All of my fam­ily at home was wor­ried sick too, so I had to call and fill them all in on the happenings. Shortly after the MRI, the Neu­rol­o­gist pulled me aside. She asked what had hap­pened, if I knew any­thing. But the worse part is, that I didn’t. Eddy had appar­ently went to a house party the night of his birth­day as I found out shortly after by some peo­ple at a local bar. The doc­tor pro­ceeded to tell me that his brain had com­pletely shifted, and this could not be done by a sim­ple fall. So, our con­clu­sion to all of this was that Eddy took a severe blow to the head. Hence, some­one did this to my poor, poor now deceased brother the night of his birth­day at that party. It makes me so sick to think of it now, but later when I asked ques­tions, no one seemed to know any­thing of course. 2) To just go home and pray it heals by itself. We went home the next day, and the fol­low­ing week Eddy returned to work. Every­thing appeared fine, but then the Grand Mal Seizures started. Our fam­ily doc­tor gave Eddy Dilan­tin to con­trol the seizures, how­ever at that time Eddy con­tin­ued to drink so the pills never even kicked into his sys­tem. What a hor­ri­ble hor­ri­ble thing to live through, as to see some­one hav­ing one seizure after another! My stom­ach was con­stantly sick, and I was walk­ing on pins and nee­dles, just wait­ing for the next seizure to strike. Alot of times he would end up hurt­ing him­self through them, (he once Banged his head off of the cement floor in the base­ment one night after falling down the stairs, etc) I would con­tin­u­ally have to get the ambu­lance to our house as his heart rate would go up pro­fusely. It was an extremely deves­tat­ing thing to live through. He would take one seizure and come out of it, and then a lot of times wait about 45 min­utes until another one struck. We begged and pleaded with Eddy to get some help, until 2004 when he went will­ingly to our local detox cen­ter. He seemed to really like it there, and we vis­ited him often. He went back and forth to work from there, and the seizure meds were actu­ally work­ing because he was not drink­ing. I sure felt at ease in my heart know­ing he was there and he was safe. After stay­ing there a short while, Eddy’s bosses vis­ited him to see if he would like to go to the Ken Brown Recov­ery Home here to seek fur­ther help, more detailed than at the Detox cen­ter. He agreed, and they said they would give him sick pay while he got better. The guys at that Recov­ery home treated Eddy like gold. They had him involved in alot of activ­i­ties, and he made alot of friends there. Eddy stayed there for a few months, until the bosses vis­ited him one more time, ask­ing if he would like to go to an exten­sive Alco­holic Rehab Cen­ter 3 hrs east of here called “Camilus”. He told them he would think about it, and then called to tell us of his deci­sion, that he would go and get exten­sive treat­ment for once and all. Those words were like music to our ears! Camilus is very well known around here as well as a very rep­utable Rehab Center. That was at the begin­ning of Novem­ber 2004. They sched­uled him to leave the morn­ing of Novem­ber 30th. We had a lot of fun that evening, and shared tons of laughs. I too stayed the night at my par­ents, and said my goodbye’s to my brother Eddy as I knew that they were leav­ing really early that next morn­ing for the Rehab Center. That was the very last time that I saw my brother alive. I miss you and love you so much brother. Rest in peace Eddy. My heart con­tin­ues to ache, but I know that you are my Guardian Angel. I know that you are in a bet­ter place now. The LORD is my shep­herd; I shall not want. He maketh me to lie down in green pas­tures: he lead­eth me beside the still waters. He restoreth my soul: he lead­eth me in the paths of right­eous­ness for his name’s sake. 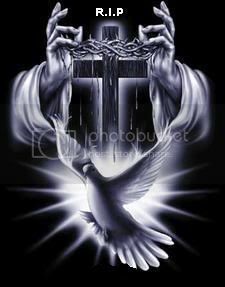 Yea, though I walk through the val­ley of the shadow of death, I will fear no evil: for thou art with me; thy rod and thy staff they com­fort me. bright shin­ing as the sun. Heather my thoughts and prayers are with you dur­ing these hard days. It is such a sad story and such an unnec­es­sary death. I guess no one would own up to what really hap­pened. May his soul rest in Peace, and pray that your brother is in a bet­ter place. We hope that one day jus­tice will be served. You went throu alot , your brother unfor­tu­nately passed away know­ing what thing he had a very car­ing sis­ter. Not every­one would do that. My thoughts and prayers are with you. I knew Eddy for a short period of time. He really made me laugh that night before he went to the Rehab cen­tre. I know that he will be with you and your fam­ily always. He was such a won­der­ful and hilar­i­ous per­son. He is in heaven mak­ing god laugh right now. My thoughts and prayers are with you and of course my sec­ond fam­ily, always!! 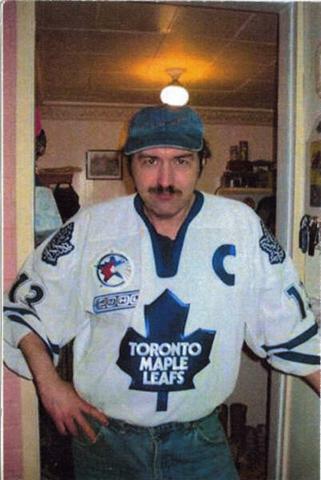 RIP Eddy.. and please let the Leafs win! xoxoxo! Your story touched my soul; how very very sad for you and your fam­ily to have to watch some­one you love so much suf­fer from alco­holism. Thank you so much for shar­ing your story and your pain with us. Know that your brother is in a bet­ter place, free from any addic­tion. You have your mem­o­ries of him; keep them close to your heart. May God embrace him in His ever­last­ing love and may God give you and your fam­ily peace. I feel for you this made me cry as it hit home not exactly for the same rea­son but for los­ing some­one to another dis­ease. What­ever you do please dont blame your­self as you were there for him. This trib­ute just shows how much you care and love him. He knows this and sees this. Smile and remem­ber all those times together dont focus on the I should haves. You did every­thing you could! RIP Eddy. Thank you very much for shar­ing; alco­holism is not some­thing easy to watch hap­pen with a loved one. It took courage to share this, RIP Eddy.